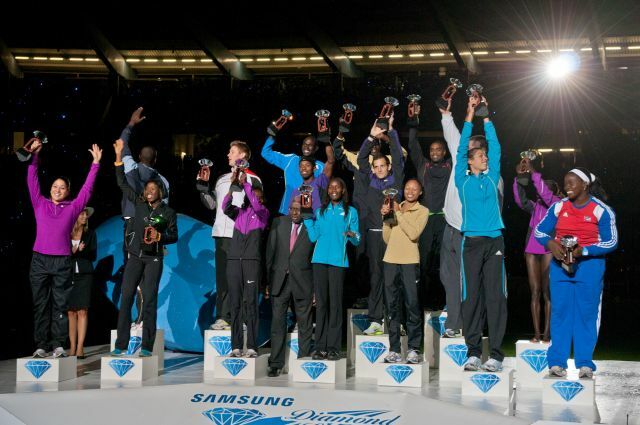 Diamond League Vice-Chairman Patrick Magyar has made several comments about field events in the media recently. As I wrote last week, it is not the events that are the problem, it is how they are presented. But it is much easier to criticize as it is to offer suggestions. My first suggestion is to add the hammer, by I’ve beaten that point to death, so instead is put together ten ideas that could help the Diamond League better present itself and the field events. These are all simple solutions that could be implemented immediately. The costs and logistics are so simple that it’s laughable they haven’t tried at least a few of them already. Let us know who is winning. At each Diamond League meet there are perhaps a dozen screens on the infield, but not one will tell you who is leading each event. They simple tell the last result and the rank that athlete is in. Can we put that result in context? How close is the thrower to the next place? Who is winning? Etc. This simple information is missing both in the stadium and on television. Better scoreboards and better markers can also be usedin person and ditigally to show where each throw has landed and its relative position. The field events are viewed as boring and they can be when you only show one throw on television. But if you let the fans in on the back-and-forth suspense it becomes an engaging battle that the sprints cannot match. The discus is often so early that no one is in the staidum yet and TV coverage is hours away. At least a live stream would allow fans around the world to follow. Let it stream. This is the 21st century, but the whole online branding of the Diamond League is backwards. It is slow, clunky, and lacks half the information we want. This is an area where the meet could learn tons from the Pre Classic or even the IAAF, which fully embraces new media and is doing an excellent job with Spikes Magazine. The simplest addition would be to add streaming video. The first two hours of every Diamond League meet are never shown on television. Why not stream them for free? For track fans this would provide coverage of events left on the fringe, like the women’s discus which always seems to start two hours before the main program. It is also a win-win situation since it would give added exposure to sponsors, athletes, and would even benefit the current TV rights holders because it gets people interested in the meet and will lead to increased viewing audience for the “main” program. Create a fun fantasy league. The need for a fun fantasy league is clear as there are already thousands of people playing the current version which is mediocre at best, and full of software glitches. A fantasy league brings more attention to the field events since you have to know all the events to do well. Making a better fantasy leeague would get more people involved and help the presentation of the field events by making each star’s name more recognizable. But the fantasy league needs to be more than a picking contest. Let’s bring in a draft, trades, etc. You might have to pick one thrower, one jumper, one sprinter, and one distance runner each week. I don’t know exactly how is the best way to execute this, but I know it can be done better and I’m serious about this point. If someone has some programming skills and ideas, I’m willing to help fund a project. Skip the warmups. Runners do not get a warm up on the track. So, facilities permitting, why not have field event athletes warm up outside too? With the right logistics, athletes could be quickly ushered into the stadium with no hiccup in their preparations. And then fans get pure action from the start and the meet can be better packaged in a small time window. Meet directors complain there isn’t enough time for lots of thrower. Well there is if you think a little differently. Add a unique flavor to the meets. While a brand needs to have uniformity, it also needs to have uniqueness so they can stand out. Most of the Diamond League meets have a rich history, but over the past few years that has been lost as each meet seems to look and feel the same. Same fields, same events, same winners, and same branding. Formula One has all of these too elements, but is nevertheless able to create a unique character for each race even though the drivers and winners change little. Everyone knows the Monaco course, for example. It’s interesting that Monaco is perhaps the best at this in the Diamond League. When I think of Monaco I think of fast middle distance times. Zurich has a rich tradition of hurdles that it could embrace. Wouldn’t it be cool if each meet had it’s own unique focus that made it stand out a little? And this would also mean some meets with a heavier focus on the field events. 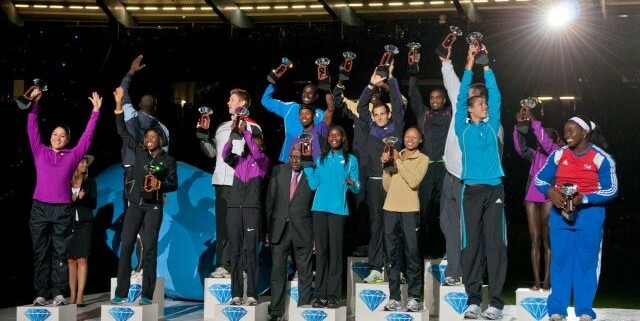 Everybody is a winner in the Diamond League. Name a winner. As Jesse Squire of the Daily Relay put it to me: “Who’s #1? This should be a simple question and not have 32 different answers.” The Golden League had many faults, but one thing it had going for it was that it had an overall winner at the end of the season. The Diamond League lacks a format for that. The IAAF still names an athlete of the year, but that comes at an anticlimactic point in mid-November. As the season comes to a close we want to see who is the best and have them fight for that title on the track. And as some of the most dominant names this year have been field event athletes (e.g. Renaud Lavillienne, Sandra Perkovic, Valerie Adams, Anita Wlodarczyk, etc. ), this can only help the field events. Bring out the personalities. Stars are made from a combination of performance and personality. Rarely do we get to the see personality side, especially in the field events. Kevin Sully, also of the Daily Relay, mic up athletes during the competition. Put mics on athletes. What did Anita Wlodarczyk’s coach tell her after she nearly fouled out at the European Championships? Whatever it was it helped her reach a championships record. I’d love to hear what Mekhissi has to say to his competitors in the call room and start line. How about Now the only time we hear from athletes is in the obligatory cliche-filled post race interview. Actually present them on television. The biggest question for field events now is not whether the presentation is good or bad, but whether there is any presentation at all. Many events get no television exposure. When they are shown, the most common formula is to simply show the winner or top three finishers. This saps all the drama from the events, especially when results are being chatted about already online. It is true that a field event can be won in the first round. This is cited as a negative since it could remove drama. But if you are watching the competition from start to end it changes nothing. The leader has never won until their last attempt and are always under pressure. That in iteslf is a winning formula, without the need for more exotic changes to the competition structure. For the right price, athletes would be willing to make concessions to the structure too. Four attempts? Knockout rounds? These have all been tried unsuccessfully before, but each time it was promised in return for making the event more television friendly. 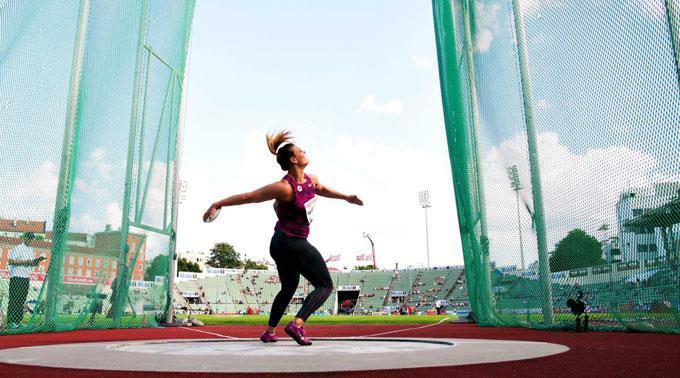 But the TV presentation continues to be nonexistent and field event athletes have been left with fewer attempts and even less exposure than before. Make the changes in combination with better presentation and it still could be an even more succesful formula, but let’s start with just showing them a little more. There are just as many ways to improve the presentation of running too. Because I can’t help myself, I have to add two new points that have been especially problematic this year. Hopefully they will not have the fate of(my other suggestions in 2010 which are waiting to be implemented. Never race the 100- and 200-meters at the same meet. This only dilutes the fields and gives stars a chance to dodge each other. As a result the races become a foregone conclusion and the only thing left in the air is if there will be a record (which we haven’t had any of recently). If sprinters want to make money, let them face off. Reduce pacemaking. The Diamond League tried and failed to get rid of pacemakers. The reason: athlete’s wanted them. There are incentives in this sport that keep leading us back to pacemakers: athletes are paid bonuses by meets and sponsors for fast times, and meets are ranked based on the performances they produce. Pacemakers do have benefits. When one helps produce a record or world leading time, it brings the sport some extra attention. But more often than not pacemaker is ineffective and the result is boring. Rather than get rid of pacemaking, simply limit it to perhaps half of the races at 1500 meters or longer. Then we have a place for it but it is not overused.